you look completely gorgeous and classic. This is very St.Trinian's, no doubt, but I really love it. It's so cool to realise that our styles can go from ultra edgy and quirky to super vintage or preppy. Now, that's eclectic! Super gorgeous, the leather pleated skirt is amazing, you look SO good! You look gorgeous absolutely loving the jacket! Arabelllaa! 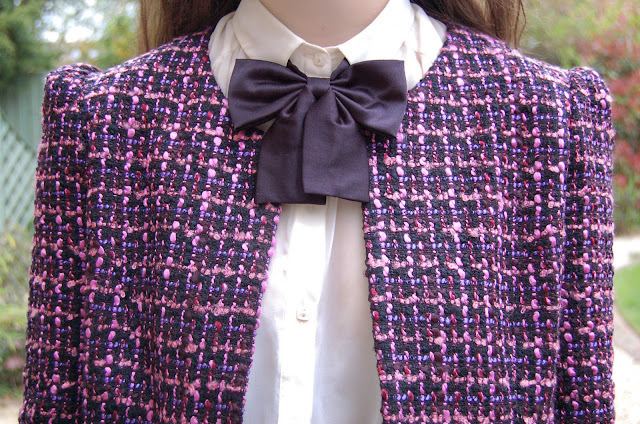 I love love the boucle jacket! The bowtie gives the entire outfit this super chic schoolgirl masculine twist! I love how you always SO creative with your outfit! You make runway style come to life for daily wear! You are such a style icon ! This outfit is just perfect! Love the jacket with that leather skirt, aaah this is just perfect! Gorgeous outfit, the blouse is gorg and that bow looks so cute! 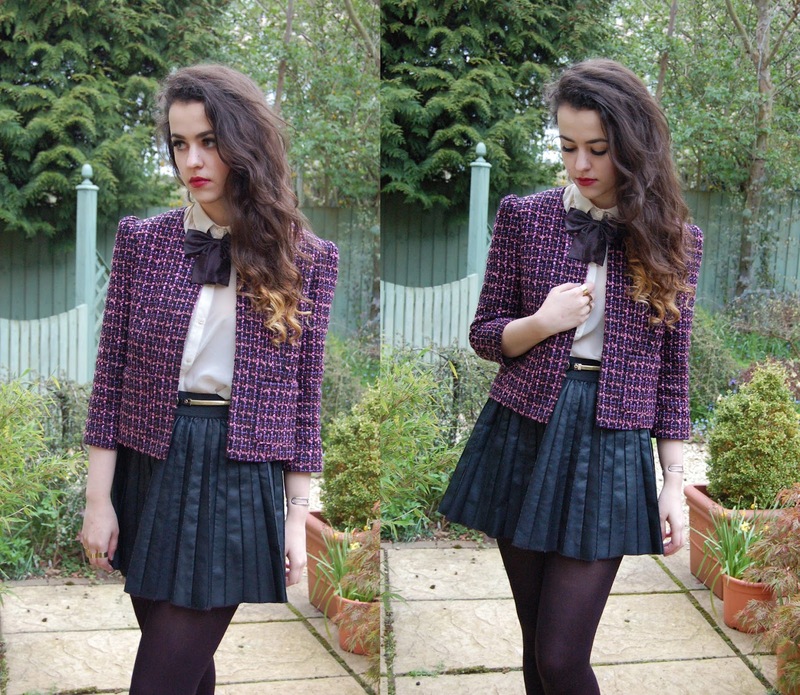 Love this look, can't beat a bit of Blair Waldorf style as inspiration- you look awesome. Gorgeous jacket love this outfit, you look lovely! you have amazing style! i'm excited to backtrack through all your archives for more goodness. xo. Your style is amazing and have a lovely blog, now following you! I love your skirt so much! Your whole outfit looks great. great outfit, you look wonderfully ! 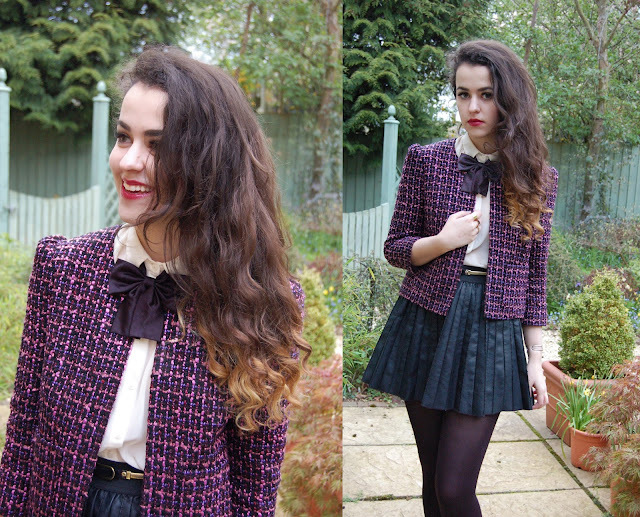 Cute outfit, loving the jacket with the little bow tie! Super cute, love the blazer! I love this look, you look fantastic - and you have hit the nail right on the head with Gossip Girl meets all girls British boarding school! Fabulous outfit, your blog is so fantastic...I will be back very soon! I've just discovered your blog, and I've seen so many of them, but yours is so inspiring, and you look amazing! Keep doing the same job! Oh my goodness, you are so beautiful - I'm absolutely in love with your outfit! Wow this outfit is stunning doll! I love your skirt wheres it from?